The reason I have recently been reading Edward Lear (blog, yesterday) and various other authors of the nineteenth and early twentieth centuries is that I have acquired a Kindle, Amazon’s e-book reader. There are plenty of out-of-copyright books that can be downloaded for it free of charge, and I have been reading (or re-reading) not only Lear but also Lewis Carroll, Conan Doyle and P.G. Wodehouse. I have to say that in general I am delighted with my Kindle. Rather than lug kilos of printed books to the West Indies for my visit last month, I was able to carry a sizeable library electronically in this one lightweight device. For extended reading, I find the Kindle much more comfortable than reading a computer screen. Its screen is not backlit, and does not flicker. You can’t read it in the dark, but you can read it in direct sunlight. The battery lasts for several weeks without recharging. However… judging by my experience, there are still certain problems with fonts and with non-ASCII characters. Despite the claim that the device, in this third generation, “supports additional fonts and international Unicode characters” (Wikipedia), it seems that ordinary downloaded books can only be displayed in three typefaces: “regular”, which means Rockwell, “condensed”, which is the same thing condensed, or “sans serif”, which is Arial or something similar. No other fonts are available. You can, though, adjust the size, the line spacing and the number of words per line. OK, so that book was a freebie, and we can tolerate the odd glitch in something that is free of charge. But I also paid good money for other books. One was Guy Deutscher’s The Unfolding of Language (which I recommend). As you would expect in a book about linguistics, Deutscher makes use from time to time of phonetic symbols. Disaster! This is what happens to a humble schwa: and as for exotica such as š and ḫ… The special characters take the form of low-res graphics, of an inappropriate size and font. I resent having such typographical incompetence in a book I have paid good money for, but I suspect the fault lies with the publishers (Random House) rather than with the makers of the Kindle. It can be done. Here is a fragment of a screenshot from another e-book (a freebie! ), coping routinely with the characters ĉ and ŝ. So wake up, other publishers venturing into e-books! You read my mind about my biggest Kindle gripe. Thought about getting a book to learn some ancient Greek (you never know when it might come in handy) but the Kindle versions I got samples of were total salad - the Greek letters that resembled their Roman cousins looked OK because it seems they just used the Roman letters (o for omicron etc), but the ones that look significantly different were those huge low-res graphics. Unusable. I still do love my Kindle. But any book with a lot of foreign letters is out. Ditto for any book where I repeatedly have to refer to endnotes or references, which is slow and clunky on the Kindle. I'm afraid I need to feel and smell paper, though this is not very environment-friendly. Google eBooks generally includes a PDF version of the original paper book. It's available on many devices, but not the Kindle. I've abandoned Kindle books and migrated to Google, partly for this reason. Kindles scan quite well. It's probably a good idea to increase the font size first. "I'm afraid I need to feel and smell paper, though this is not very environment-friendly"
I've seen this comment in various places. E book readers like the Kindle are of course made from dead trees too, albeit trees that have been dead a good bit longer. I'm not able to work out the carbon saving made in buying a Kindle; at a guess, readers of paper books ought not to feel quite as guilty as they seem to. Programs like Calibre seem to do a good job of converting Google pdf's into other formats. E-books will take off when they beceome appreciably cheaper than printed ones (I understand they still attract VAT). I second John's recommendation of Guy Deutscher's 'The Unfolding of Lanuage'. The message board for those teaching phonetics is PHONET@JISCMAIL.AC.UK . See details at https://www.jiscmail.ac.uk/cgi-bin/webadmin?A0=PHONET. You certainly won't be able to join as "Anonymous", and as "Anonymous" you're lucky to get an answer from me. Why hide? I apologize! My mistake! I had troubles with posting a comment and it only worked once I chose to post as anonymous, which is a coincidence, I suppose. The UPR is obviously a permutation of URP and, again, my mistake. Thank you very much for the reply! Dear John, I usually write as anonymous because I'm not supposed to be doing this now and I haven't got internet access at home. I know I could use a nickname or something but I'm hopeless at computers, honestly. So, Anonymous-not-Marijana, make up a name. As long as you don't post here as "John Wells", no one is likely to complain (although I'd take it kindly if you didn't try to usurp my name, which is my real name). Just choose the "Name/URL" box and choose something realistic-sounding, like Beatrice Portinari. Yes, the blame lies with the publishers. It is quite obvious that many just grab a copy of the book in some existing electronic format and run it through a conversion tool without proofreading the result. 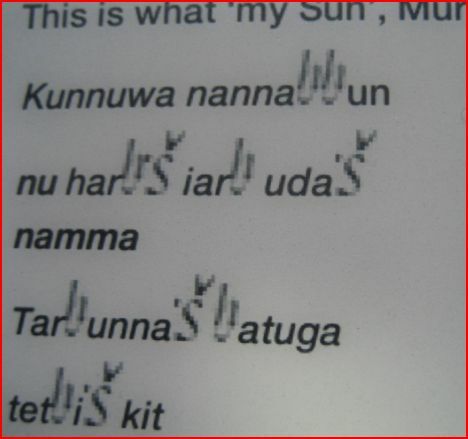 I like my Kindle a lot, but at this stage I recommend to use it only for disposable reading (novels, simple nonfiction) and not for anything that might be typographically challenging, certainly not anything language/linguistics-related. @ John Cowan: Thanks! This was much easier than I thought! Hi John! I am as delighted with my Kindle Reader as you are. It's like my wallet - it's wherever I go. Yes, I must admit there are some problems but I am nevertheless happy that some brilliant mind came up with this gadget.